This is a real gem of a book and one that – if you have any interest in the subject at all – you really ought go out and buy straight away. At one time, fly fishers didn’t make too much distinction between the species they caught, but as the years passed, using the fly for anything but trout became less and less common, until, by the late nineteenth century, targeting coarse fish was regarded as pretty eccentric. All-rounders like Francis Francis and William Senior still did it, but only as a kind of party trick to give some stuck-up host the finger and prove that they really were as good as everybody said they were. And then came a long century where if you said you were a fly fisherman, it meant that you fished for trout, salmon and maybe grayling – and it was as if nothing else would take a fly. Every other species was more or less forgotten; until the eighties, when pike fishing with a fly sloped back into fashion. To begin with, only the truly dedicated stuck at the game and it took twenty years for anglers at large to get their heads around the fact that this was really was a sensible method of catching pike, and it is a measure of how far the pendulum had swung that it has taken another decade for this book to appear, which richly deserves to serve as the manual for a generation to discover what our great-great-grandfathers knew: that you can catch anything with fins using a fly and that there are circumstances where it makes much more sense than using bait. 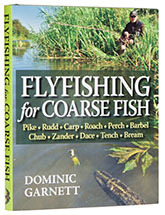 In the space of 224 large format pages, the author covers pike, rudd, carp, roach, perch, barbell, chub, zander, dace, tench and bream, with a chapter devoted to each species. The introductory chapters assume no particular knowledge of fly fishing and (as long as you have held a rod in your hand at some point) a complete beginner could pick up this book and start fishing with a good chance of success. Each species chapter covers gear, tactics, lies and watercraft, ending with a section of patterns; and the book has a wealth of illustrations. The writing is laid back, but fun and informative, and the author conveys a strong sense of a voyage of discovery – so strong in fact, that it is almost impossible to read more than a few pages without wanting to go out and have a crack oneself. Actually, I might draw the line at fly fishing for ruffe… but what the hell, there is a whole chapter on fly fishing for “other species”, which means minnows, gudgeon, bleak, orfe, eels and wels catfish. Yep, I kid you not, but that is one of the reasons why Flyfishing for Coarse Fish is such fun. Bags you try for the wels. Come on – you owe yourself a copy.